Conquer Bound Half Moon Pose In 9 Simple Steps! Think of back-bending and binding while balancing on one foot, head down. When given this description, Bound Half Moon pose may seem difficult, and even out of reach for many yoga students. Let’s not rush to conclusion! The Roman military genius, Julius Caesar postulated his unfailing strategy, “Divide and conquer!” So, here’s how to divide Ardha Chandra Chapasana or Bound Half Moon pose into simpler steps, and conquer it with grace and poise! Balancing on one foot with the torso positioned horizontally, or below horizontal, creates a new level of challenge for the vestibular system; this enhances the ability to sustain balance, and makes other poses feel easy, in comparison. Psychologically, it boost the sense of self-confidence and brings awareness to the fact that one can feel comfortable, even enjoy the less then ordinary experiences and challenges. The binding action stretches the chest and shoulder muscles. It activates the nerves in the brachial plexus, facilitates the expanding of the ribs cage and therefore allows deeper breathing, which all creates a sense of lightness and feeling good. Add this to the fact that torso positioning together with the floating sensation make this pose a reminder of a bird’s flight! Binding and arching stretches the hip flexors especially the psoas; which prevents lower back pain and hip stiffness due to long sitting hours. The binding assists with farther opening inguinal area which is rich in lymph nodes; this aspect of the pose benefits lymphatic circulation. This pose could be the first step in the direction of approaching Half Moon, and respectively Bound Half Moon. Because of the knee down position and proximity to the floor, the Knee-supported Side Plank feels safe and unintimidating it provides the student with a foundation pose to practice the preliminary skills necessary for Half Moon, and for the more advanced variations. This pose teaches how to turn the chest open with proper positioning of the shoulder blades against the back and arm extended toward the ceiling. With no fear of falling, the student can practice turning the head and gaze up that makes up one of the most challenging elements in Half Moon Pose. Knee supported Side Plank teaches how to stack the hips to acquire the open torso alignment required in Half Moon. It can be used as warm up within a practice that develops gradually toward Half Moon; it provides the opportunity to review pose-specific, basic alignment, without introducing the advanced balancing skills too soon. Knee-supported Half Moon builds on the Knee Supported Side Plank, and it brings the student one step closer to the Half Moon Pose. The challenge is added by lifting the top leg parallel to the floor, and positioning in the as required for Half Moon. Without the extra support provided from grounding the top foot, the Knee Supported Half Moon challenges the ability to balance, especially if the face turns up as it would do in more advanced variations of the Half Moon Pose. 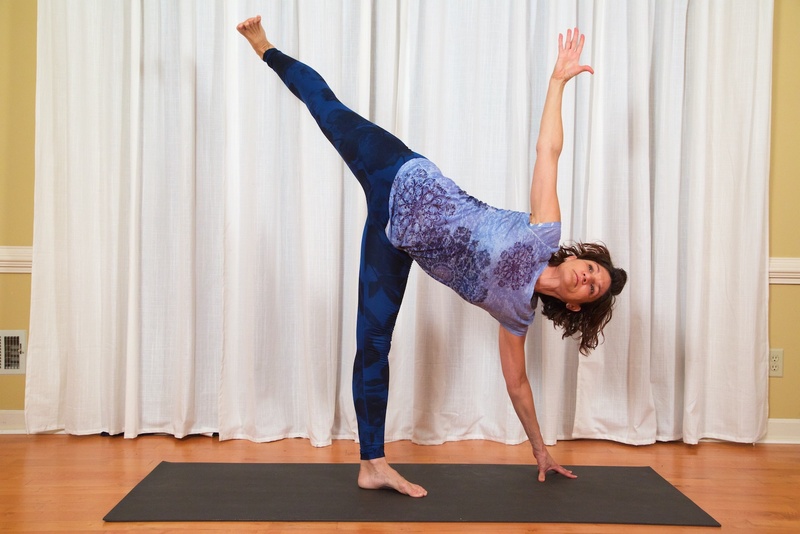 This pose requires, and teaches in the same time, to maintain the proper upper body alignment as developed in the previous variation, with the added the balance element. This is the place to incorporate the bind and the spinal extension, as the elements that would be most challenging to add to the Half Moon. The knee on the floor provides extra stability, and the proximity to the ground makes the pose non-intimidating. Therefore, it feels safe for practitioner to approach another challenging element, within the already established frame of proper alignment. At this stage of practice, the only thing left to add is the extension of the supported leg. The chair provides the much-needed support for this half way milestone, where the student brings together elements of alignment, technical subtleties, and the final positioning of the supporting leg. Although balance may be still a challenge, the distance from the floor has increased, but the chair’s seat provides the needed support for this practice to remain safe and fun. 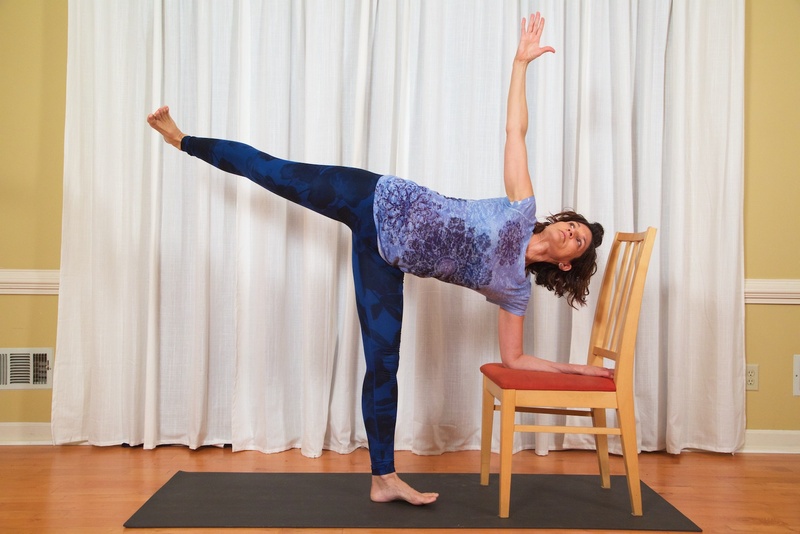 Using the chair helps practitioners to approach the bind without worrying about balance. The level of challenge increases dramatically when gazing up; losing balance is a frequent and normal part of the process. Using the chair for support prevents falling down, which otherwise is common occurrence at this stage. 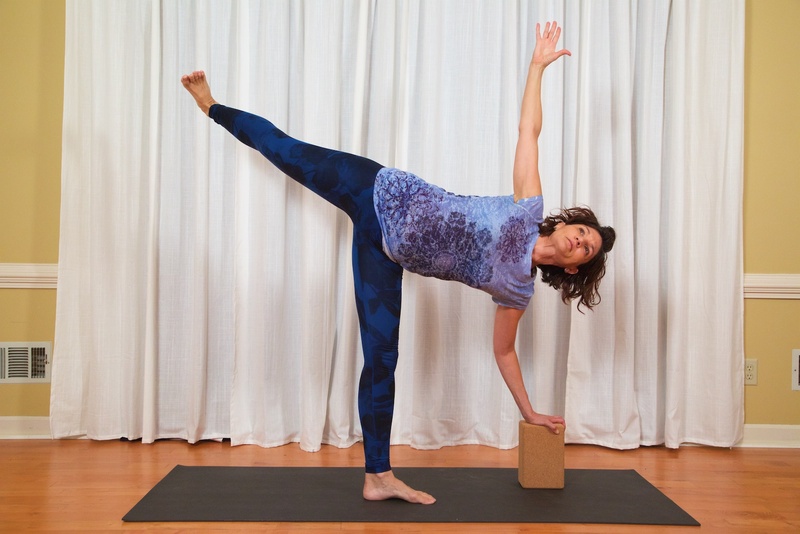 The use of blocks allows for a very gradual progress to a next level of intensity and mastery of the pose. The blocks allow the practitioner to get closer to the floor as the torso gets positioned horizontally, or slightly below horizontal. It gives the body time to adjust to the increased demand while maintaining proper form, and without stressing over balance. Using the blocks helps the practitioner to approach the bind while gradually developing better balance.However, the challenge is more marked then in the chair-supported Half Moon. Once balance has been developed, alignment mastered, and complete comfort achieved, the student will enjoy working toward the standard form of Half Moon Pose, unsupported, and subsequently introduce the bind, as shown in the first picture in this series.